It’s really easy. Call us at (416) 440-2828, we’ll help you get set up for a drop-in class. You can also request a trial booking using the button below. A member of our team will follow up with you to schedule a convenient time for your first class. “Do I have to be in good shape to take classes? Not at all! People come to us out of shape, and get in amazing shape in just weeks. Truth is, many of our members have discovered Muay Thai and kickboxing as a fresh and fun way to get in good shape. They are regular folks who workout 2 or 3 times a week and are seeing amazing results in their training goals. It certainly beats going to the gym. Nope! In the fitness kickboxing classes, you won’t be doing any fighting; but instead learn functional kickboxing moves as you hit punching bags boxing gloves. This is a real kickboxing workout with real instructors teaching you real techniques for real fitness results. It is fun, safe, and empowering. Nothing releases stress better than hitting a punching bag. We guarantee that! We also have an optional level 2 Muay Thai class emphasizing sparring that advanced members may attend. With our kickboxing and Muay Thai programs, you don’t need to be a pro fighter in other to be fit like one. Martial arts is for everyone. Our classes are VERY safe, and filled with adults of all ages, genders, and levels of fitness levels. We offer a self defense program. Our Toronto Martial Arts school teaches practical self protection skills while balancing that with modern civility. This is offered as a seperate program from the kickboxing or muay thai classes. All our classes are beginner friendly.Our well structured curriculum is designed to be progressively more challenging with time, and accommodates newer members joining the classes. You’ll also have an instructor work hand-in-hand with you during your first couple of classes, until you get more comfortable with the workouts. Martial arts is for everyone, and our classes are filled with adults of all ages, genders, and varying fitness levels. The answer is simply No. You can workout at your comfortable pace. If you have a health concern, it is always best to check with your physician before starting a new form of exercise. Both programs are offered at different times and scheduled into separate classes. We offer the best Muay Thai Toronto classes for beginners, and help gain technical skills with “ring-ready” fitness. The fitness kickboxing classes incorporate standing punching bags as part of the workout. Will I get injured? I don’t like to get hurt. We don’t like to see injuries either. Since contact is part of martial arts training, we place importance on mutual respect and an emphatic awareness for members’ well-being during workouts. The movements you are taught are safe, easy to learn, easy to understand, and easy to apply. Attending 2 to 3 classes per week will ensure you experience great fitness results with your classes. We do haves some members who can only make it to one class a week, and still get incredible results with their workouts. © T.H.A Martial Arts & Kickboxing (Toronto Hapkido Academy). All Rights Reserved. 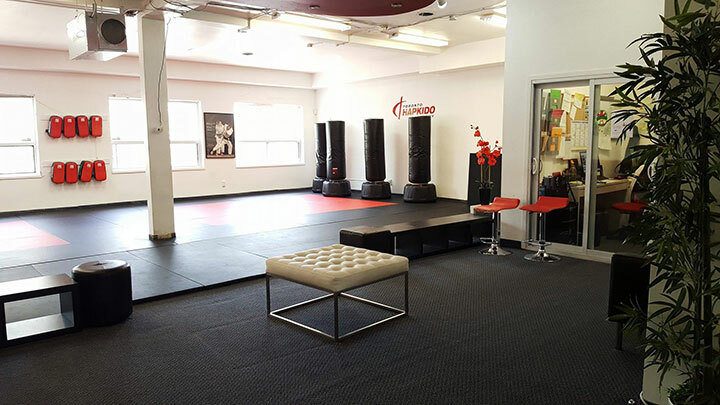 Toronto Leaside Kickboxing school location.